This vegetable lasagna is a reader favorite! Tender vegetables, a light tomato sauce, and lots of cheese make this the best vegetable lasagna recipe, ever. Jump to the Vegetable Lasagna Recipe or watch our video to see how we make it. I know that saying that this is the “best lasagna, ever” is a bold statement, but we truly believe it. I love lasagna in all it’s forms. We’ve shared a variety of them including a meaty beef and sausage lasagna, this healthier spinach and mushroom lasagna, and even this creamy chicken lasagna with white sauce and while they are all delicious, it’s this easy vegetable lasagna that truly has my heart. This veggie lasagna is easy to make, made from scratch, and calls for simple ingredients. 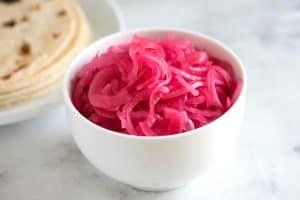 The recipe is adaptable based on the vegetables you have available to you. In our photos, we’ve used zucchini, yellow squash, red peppers, and onions, but a variety of veggies can work in their place. You can make this lasagna gluten-free, dairy-free, and vegan. Check our notes below for suggestions. Cook your lasagna noodles OR skip this step and use no-boil noodles. Even though we use regular lasagna noodles in our video, I actually prefer the texture of no-boil noodles and bonus, it’s easier! Make the simple tomato sauce, which takes about 20 minutes. If you’re going to be short on time, the sauce can be made up to three days in advance. Combine ricotta cheese, egg, and a bit of salt together. Choose a high quality ricotta for this. Unfortunately quite a few brands miss the mark when it comes to great tasting ricotta. I like BelGioioso Ricotta con Latte Whole Milk, Sorrento, and if I can find it, freshly made ricotta from our local cheese shop. Assemble the lasagna by layering the vegetable sauce, noodles, the ricotta mixture, and shredded cheese. The lasagna bakes in the oven for about 35 minutes. I like to bake it covered for 20 minutes, and then uncover it so the top and cheese get some color. 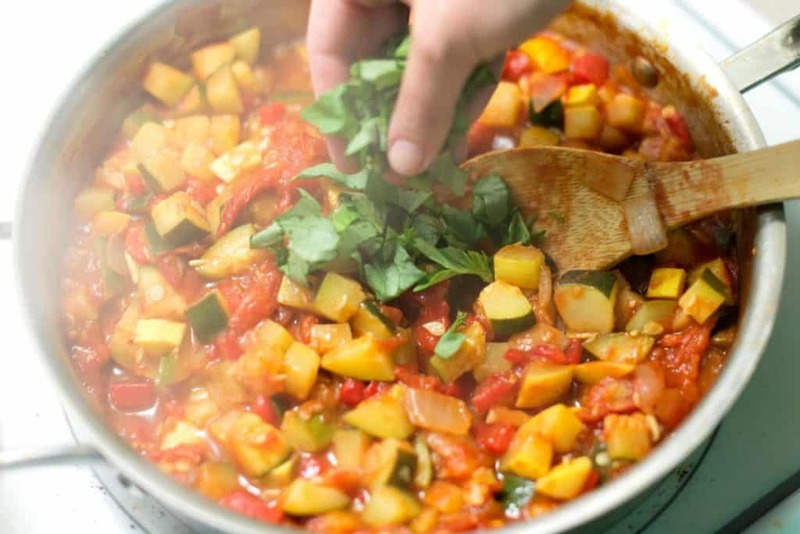 The vegetable sauce takes about 20 minutes and can be made up to 3 days in advance. Bake the lasagna covered for 20 minutes, and then uncover and continue to bake until done. One of the things I absolutely love about this veggie lasgana recipe is that it is so easy to adapt to what we have in the house (or the season). Winter squash like butternut or delicata squash would be excellent for a fall-inspired lasagna. I’d peel and cube them. For a gluten-free vegetable lasagna, use gluten-free noodles or use vegetables to make the noodle layer. Layer long, thin slices of eggplant or zucchini in place of the noodles. I prefer to partially cook the slices by roasting or grilling first so they don’t add too much moisture to the lasagna. For a dairy-free vegetable lasagna, swap the ricotta cheese and egg for almond ricotta. You can make it yourself or buy it (Kite Hill is a popular brand). I also like swapping the cheese called for in the recipe for a generous sprinkling of nutritional yeast. For a creamy vegetable lasagna, use our creamy chicken lasagna recipe, but swap the chicken sausage for sautéed vegetables. The vegetable sauce can be made in advance and should last in your refrigerator up to 3 days and in your freezer for about three months. We recommend using freezer-safe glass containers, or double layers of freezer bags to store sauces. To thaw, leave it overnight in the refrigerator. You can refrigerate unbaked lasagna. 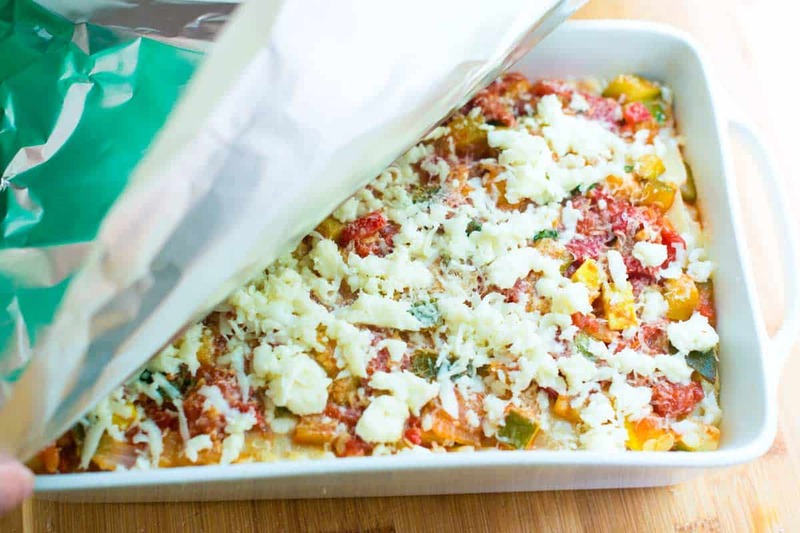 Cover and refrigerate the assembled, but unbaked lasagna up to 2 days. When you cover, use parchment or wax paper between the lasagna and aluminum foil. Aluminum foil can react with the tomatoes. Our Easy Garlic Mushroom Pasta is quick to make and delicious thanks to garlic butter mushrooms. This Fresh Veggie Spaghetti combines lots of vegetables into a fresh and simple sauce. 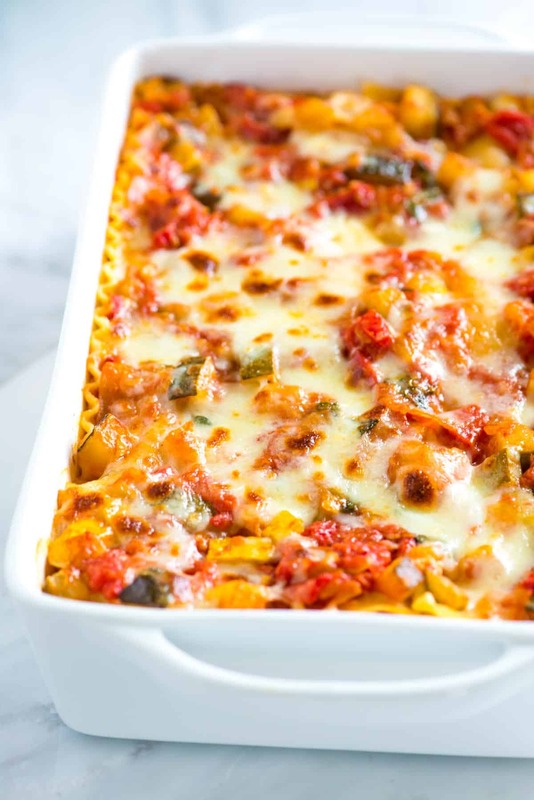 This Easy Vegetable Baked Pasta is loaded with vegetables, extra cheesy, and seriously irresistible. Inspired by this vegetable lasagna recipe, these Veggie Lasagna Roll Ups are a fun spin on the original. For a quick and easy dinner, try my favortie Orzo Pasta Recipe with Tomato and Basil. 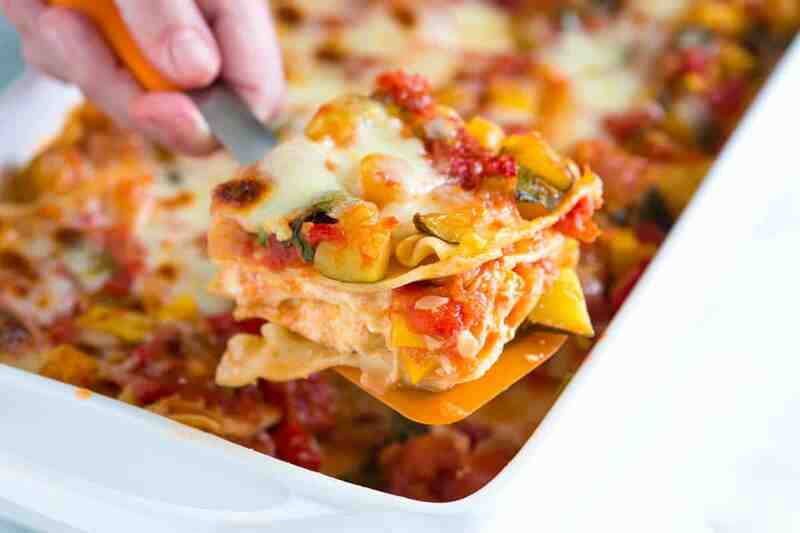 This vegetable lasagna recipe is a reader favorite! Tender vegetables, a light tomato sauce, and lots of cheese make this the best vegetable lasagna recipe, ever. We really do not miss the meat. 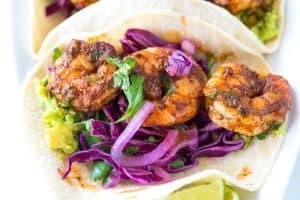 Add your favorite vegetables to this, we have given suggestions in the article above. Bring a large pot of salted water to the boil then cook lasagna noodles according to package directions. (We add a couple teaspoons of olive oil to the water so the noodles do not stick together). Drain then lay flat on a sheet of aluminum foil. Heat the oven to 350 degrees Fahrenheit. Lightly oil a 13-inch by 9-inch baking dish or spray with non-stick cooking spray. Heat the olive oil in a wide skillet with sides over medium heat. Add onion and cook, stirring occasionally until translucent, about 5 minutes. Add the garlic, red pepper flakes, zucchini, squash, and a pinch of salt then cook, stirring occasionally until softened but still with some crunch, another 5 to 8 minutes. Stir in the roasted red peppers and crushed tomatoes. Bring to a low simmer and cook until the liquid has thickened and reduced by half, about 5 minutes. Add the basil and season to taste with additional salt and pepper. While the sauce cooks, stir the ricotta cheese, eggs, and a 1/2 teaspoon of salt in a medium bowl until blended. Spoon just enough vegetable mixture into the baking dish to lightly cover the bottom (about 1 cup). Arrange four noodles lengthwise and side by side to cover the bottom. (If the noodles are short on one end, you may need to cut an extra noodle and place into dish to cover where the other noodles have not). Spread about half of the ricotta cheese mixture over the noodles. Sprinkle with a third of the parmesan cheese and a third of the mozzarella cheese. Top with a third of the vegetable mixture. Add another layer of four noodles then repeat with remaining cheese and vegetables. Finish with a final layer of noodles, vegetables, parmesan cheese and mozzarella cheese. Cover loosely with aluminum foil and bake 20 minutes, uncover then bake 15 minutes until cheese is crusty around the edges. To make the cheese golden brown on top, slide under the broiler for 1 to 2 minutes. Let rest 10 to 15 minutes before serving. 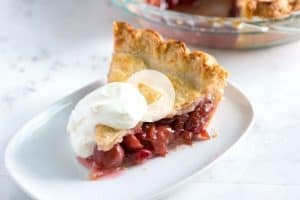 Make-ahead tips have been shared in the article above. 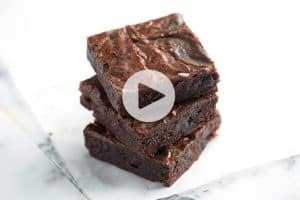 The sauce can be made up to three days in advance, you can refrigerate assembled and unbaked lasagna up to 2 days, and the baked lasagna can be frozen. For a gluten-free lasagna, use gluten-free noodles or use vegetables to make the noodle layer. Tips have been shared in the article above. For a dairy-free and egg-free lasagna, swap the ricotta cheese and egg for almond ricotta. You can make it yourself or buy it (Kite Hill is a popular brand). I also like swapping the cheese called for in the recipe for a generous sprinkling of nutritional yeast. I just made this lasagna for our Easter celebration. It’s really outstanding. Everyone was very please. I love how you cut the vegetables in chunks so that the sauce has so much substance and texture. Also adding the roasted peppers is just a perfect touch. I roasted some eggplant alongside the peppers. Thank you for sharing, this is a real keeper. Is it okay to substitute with the parmesan cheese with the Kraft Parmesan cheese in a can (plastic container)? Hi Janice, The flavor will be different (the canned version might be a bit saltier? ), but if that is all you have you can use it. I’d use a bit less, though. You can also leave it out if you’d like, especially since we call for mozzarella, too. This is definitely a keeper! Great flavor. Another winner from Adam & Jo. I swapped squash for aubergine (eggplant). I roasted the aubergine in the oven with some olive oil first and chopped and added to the roasted peppers. It was delicious and I got so many compliments. I think there are a few more people who will be cooking this on a regular basis. Thank you both. I am glad I read your review. I wanted to add eggplant but did not think of roasting it first. That is a good idea. Thanks.